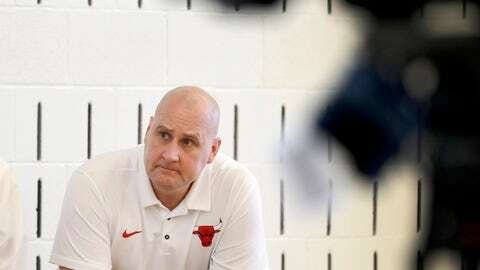 CHICAGO (AP) — John Paxson remains convinced the Chicago Bulls are on the right path despite one of the worst records in franchise history and that they have the coach they need in Jim Boylen. Chicago’s top basketball executive, Paxson said Thursday he expects the team to compete for a playoff spot next season. He also said it’s “very possible” Boylen gets a contract extension. The Bulls went from 27 victories to finishing with a 22-60 mark in the second year of their rebuild. That gave them the fifth-worst win percentage (.268) in franchise history — the lowest since the 1998-99 team went 13-37 (.260) following the breakup of the dynasty teams in the franchise’s heyday. The 22 victories were the fewest for Chicago since the 2001-02 team finished 21-61. And with a 9-32 mark at the United Center, Chicago tied New York for the league’s worst home record. Paxson said chairman Jerry Reinsdorf has not given him or general manager Gar Forman a win-now-or-else mandate, though they understand “the reality of this business.” For now, they’re safe and so is Boylen. He got off to a rocky start and finished with a 17-41 record after getting promoted from assistant coach when the Bulls fired Fred Hoiberg. In his first week, Boylen insisted the team’s conditioning and toughness needed to improve. The Bulls suffered a franchise-record 56-point loss to Boston in which he used five-man substitutions and kept the starters out for about the final 20 minutes. Things boiled over the following day, when he called for practice after back-to-back games and a few players responded by raising the possibility of a boycott. Though he acknowledged the perception that the Bulls aren’t a well-run organization, saying some of the criticisms are accurate and others are not, Paxson was adamant Chicago can land superstars. Though Paxson isn’t banking on lottery luck, the Bulls could use some. Chicago has a 12.5% percent chance to land the No. 1 pick and, presumably, Duke’s Zion Williamson in the drawing May 14 in Chicago. Moving up to No. 2 could mean getting Murray State’s Ja Morant. The Bulls’ odds of picking in the top four are 48%. Whether Kris Dunn improves after a disappointing season or the Bulls look outside for help, Paxson made it clear the Bulls need better play at point guard next season. Dunn went from averaging 13.4 points to 11.3 in 46 games. And if the Bulls bring in competition, he insisted that’s just fine with him. “I’m a dog, I don’t run from nothing,” Dunn said.